The inflatable fruitcake: even better than the real thing. While it might be too late to get these gifts purchased, wrapped and under the tree by tomorrow, you can at least place an order and print out a picture of your gift with a “to be delivered soon” note attached. (Hey – it’s better than nothing, right?) Here are a few unique gift items that we’ve rounded up in the final hours before the Christmas bonanza begins. 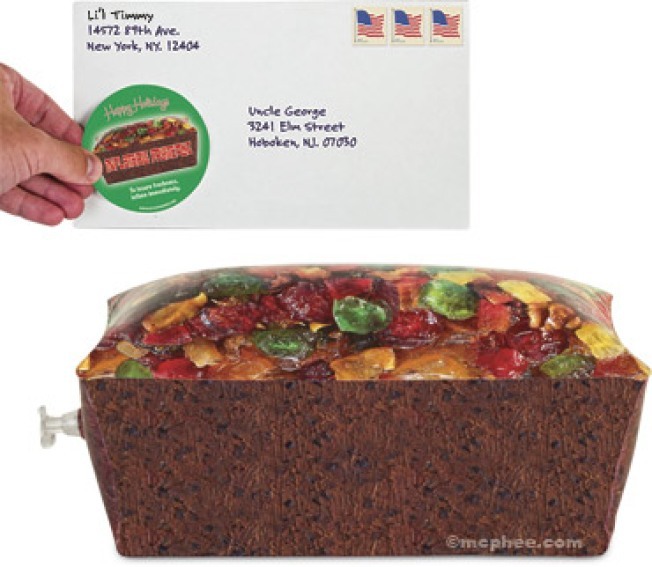 1) Have you ever seen anything like the inflatable fruitcake from McPhee.com? It’s inflatable, it’s not edible, and it’s a totally bizarre conversation piece. Who wouldn’t want one? It’s only $6.95. While you’re on the McPhee site, check out other unusual finds like squirrel underpants or corn dog air fresheners. 3) Tired of lugging a banana to work in your briefcase only to find that it’s brown and smashed up against your AC adapter? Um, yeah… us, too. Banana Bunker to the rescue! Seriously, who thinks of these things? $4.99 each or 5 for $19.95. 4) Know a fashionista on a budget? Get her a gift card from BagBorrowOrSteal.com, where you can rent high-end designer handbags and other accessories for a minimal fee.